Subsurface exolife by Manasvi Lingam and Abraham Loeb, International Journal of Astrobiology, Apr 2019. 25 Feb 2019: NASA may send a drone to Titan. 18 Jan 2019: Microbial life found under 1,100 meters of ice in Lake Mercer, Antarctica. A nuclear-powered 'tunnelbot' to search for life on ...Europa, University of Illinois (+Newswise), 14 Dec 2018. The hunt for life below Antarctic ice by Douglas Fox, Nature, 10 Dec 2018. 28 Jun 2018: Plumes of ice and water vapor from Enceladus contain complex organics that could come from life. Evidence of a plume on Europa from Galileo magnetic and plasma wave signatures by Xianzhe Jia et al., Nature Astronomy; and commentary, Old Data Reveal New Evidence..., NASA, 14 May 2018. TRAPPIST-1 Planets Could Harbor 250 Times More Water Than Earth's Oceans by Doris Elin Salazar, Space.com, 07 Feb 2018. Disequilibrium biosignatures over Earth history and implications for detecting exoplanet life by Joshua Krissansen-Totton, Stephanie Olson and David C. Catling, Science Advances, 24 Jan 2018. Exoplanet science 2.0 by Caleb Scharf, Debra Fischer and Victoria Meadows, Nature, 08 Jan 2018. Exoplanet hunters rethink search for alien life by Alexandra Witze, Nature, 20 Nov 2017. Signs of life by Daniel Clery, Science, 03 Nov 2017. A Novel Strategy to Seek Biosignatures at Enceladus and Europa, by Philip Judge, Astrobiology, Sep 2017. Could It Be Snowing Microbes on Enceladus? Assessing Conditions in Its Plume and Implications for Future Missions, by Carolyn C. Porco, Luke Dones, and Colin Mitchell, Astrobiology, online 11 Aug 2017. 19 Apr 2017: ...62-mile-high plume of water on Europa. 22 Feb 2017: ...at least seven [earthlike] planets ...revolve around TRAPPIST-1. 17 Feb 2017: Ceres ...joins the list of locations in the solar system that may harbor life. Could Dark Streaks in Venus' Clouds Be Signs of Alien Life? by By Keith Cooper, Astrobiology Magazine, 05 Jan (+Space.com, 11 Jan) 2017. Reorientation of Sputnik Planitia implies a subsurface ocean on Pluto, F. Nimmo et al., doi:10.1038/nature20148, Nature, online 16 Nov 2016. Cassini data reveal subsurface ocean on Saturn's moon Dione, by Brooks Hays, UPI (+Saturn Daily), 05 Oct 2016. Pluto's 'heart' sheds light on a possible buried ocean, Brown University, 23 Sep 2016. ...Possible Water Plumes Erupting on Jupiter's Moon Europa, HubbleSite (+Newswise), 26 Sep 2016. NASA's publicity on Europa and potential life supported in its ocean, from Max Wallis, 27 Sep 2016. Ocean worlds: The search for life in the solar system's other seas by Joshua Sokol, New Scientist, 10 Aug 2016. Earth-sized planet around nearby star is astronomy dream come true by Alexandra Witze, Nature News, 25 Aug 2016. Was Venus the First Habitable World of our Solar System? by M.J. Way et al., doi:10.1002/2016GL069790, Geophysical Research Letters, online 11 Aug 2016. The first metazoa living in permanently anoxic conditions by Roberto Danovaro et al., doi:10.1186/1741-7007-8-30, BMC Biology, 06 Apr 2010. Europa's ocean may have an Earthlike chemical balance, American Geophysical Union (+Newswise), 17 May 2016. Three Potentially Habitable Worlds Found Around Nearby Ultracool Dwarf Star, European Southern Observatory (+Newswise), 02 May 2016. 10 Apr 2016: Diverse microbial life thrives in aquifers under the deep ocean floor. Pluto's moon Charon may have hosted a vast ocean by Sid Perkins, Science, 19 Feb 2016. Icy volcanoes may dot Pluto's surface by Alexandra Witze, Nature News, 9 Nov 2015. 21 Oct 2015: ...It seems that Europa's ice has been penetrated often in the past, and possibly in geologically recent time.... Astrobiological materials could be transported to the ocean via these impact-created conduits. John R. Spence et al., "Enceladus: An Active Cryovolcanic Satellite," revised pdf: 6 May 2009. New Pluto Images from NASA's New Horizons: It's Complicated, NASA, 10 Sep 2015. More than 100 billion billion Earth-like planets might exist, New Scientist, 26 Aug 2015. The man who tries to find life on Enceladus, Jonathan Lunine, YouTube, published 20 Jul 2015. Potential geysers spotted on Pluto by Eric Hand, Science Daily News, 17 Jul 2015. What price Europa? by Jeff Foust, The Space Review, 1 Jun 2015. Our Solar System's 9 Extraterrestrial Oceans in One Surprising Infographic by Jason Dorrier, Singularity Hub, 10 Apr 2015. 16 Mar 2015: Ganymede has more ocean water than Earth. Kenneth Chang, "Suddenly, It Seems, Water Is Everywhere in Solar System" [html], The New York Times, 12 Mar 2015. Gabriel Tobie, "...Enceladus' hot springs" [html], doi:10.1038/519162a, Nature, 12 Mar 2015. "...The first evidence of ongoing hydrothermal activity beyond Earth." McKay Christopher P., Anbar Ariel D., Porco Carolyn, and Tsou Peter, "Follow the Plume: The Habitability of Enceladus" [html], doi:10.1089/ast.2014.1158, Astrobiology, Apr 2015. Eric Hand, "Plumes on Europa tease NASA mission planners" [html], doi:10.1126/science.347.6225.932, Science, 27 Feb 2015. NASA Plans to Search for Life on Jupiter's Europa (2 min. video), The Wall Street Journal, 3 Feb 2015. Fish live beneath Antarctica by Douglas Fox, Nature News, 21 Jan 2015. Exoplanet bounty includes most Earth-like worlds yet by Alexandra Witze, Nature News, 6 Jan 2015. Analysis of spacecraft data reveals most Earth-like planet to date by Daniel Clery, Science News, 6 Jan 2015. Plate tectonics found on Europa by Alexandra Witze, Nature News (+NASA JPL), 7-8 Sep 2014. Timothy D. Brandt and David S. Spiegel, "Prospects for detecting oxygen, water, and chlorophyll on an exo-Earth" [abstract], doi:10.1073/pnas.1407296111, Proc. Natl. Acad. Sci. USA, online 2 Sep 2014. 25 August 2014: Link to a BBC Interview with Bill Nye. 25 August 2014: ...The frequency of Earth-like planets around stars smaller than the Sun might be as high as 40-50%. Brent C. Christner et al., "A microbial ecosystem beneath the West Antarctic ice sheet" [abstract], doi:10.1038/nature13667, p 310-313 v 512, Nature, 21 Aug 2014; and commentary: Lakes under the ice: Antarctica's secret garden by Douglas Fox, Nature News, 20 Aug 2014. "Samples from a lake hidden under 800 metres of ice contain thousands of microbes and hint at vast ecosystems yet to be discovered." Natalie M. Batalha, "Exploring exoplanet populations with NASA's Kepler Mission" [abstract], doi:10.1073/pnas.1304196111, Proc. Natl. Acad. Sci. USA, online 21 Jul 2014. Gordon Cooper comments about exploring Europa, with links, 30 Apr 2014. 4 Apr 2014: A sea under the South pole of Enceladus. 3 Feb 2014: ...A variety of processes can make a planet or moon more benign to life than Earth. 20 Jan 2014: ...A whole new ecosystem that no one had ever seen before. John R. Spencer, "Glimpsing Eruptions on Europa" [abstract], doi:10.1126/science.1248879, p 148-149 v 343, Science, 10 Jan 2014. David S. Spiegel et al., "Structure of exoplanets" [Open Access abstract], doi:10.1073/pnas.1304206111, Proc. Natl. Acad. Sci. USA, online 30 Dec 2013. Lorenz Roth1, Joachim Saur et al., "Transient Water Vapor at Europa's South Pole" [html], doi:10.1126/science.1247051, Scence, online 12 Dec 2013; and commentary: Jupiter's icy moon Europa 'spouts water' by James Morgan and Rebecca Morelle, BBC News, 12 Dec 2013. ...Europa's choppy ocean looks friendly to life by Nicola Guttridge, NewScientist, 1 Dec 2013. 5 Nov 2013: ...It suggests that our Milky Way galaxy contains something like 40 billion Earth-sized planets with lukewarm temperatures. 11 Oct 2013: DNA repair mechanisms could allow life to persist on other icy worlds. Gravity controls icy moon Enceladus's spew by Melissa Hogenboom, BBC News, 31 Jul 2013. 13 Jul 2013: ...Genetic sequences from crustaceans, mollusks, sea anemones, and fish.... in water samples from Lake Vostok. Richard A. Kerr, "More Support for an Ocean in Enceladus" [abstract], doi:10.1126/science.340.6129.139-a, p139 v340 Science, 12 Apr 2013. Antarctic Lake Vostok yields 'new bacterial life' by Paul Rincon, BBC, 7 Mar 2013. Discovery of large conical stromatolites in Lake Untersee, Antarctica by Dale Andersen, SETI Institute, 6 Feb 2013. 29 Jan 2013: A drill team in Antarctica has reached Lake Whillans. Updated 7-11 Feb 2013. Search for Life Suggests Solar Systems More Habitable than Ours, The Ohio State University (also Newswise), 3 Dec 2012. 27 Nov 2012: Life does fine in sub-zero brine locked under ice for millenia. Asteroid Belts of Just the Right Size are Friendly to Life, Hubble Science, NASA, 1 Nov 2012. 30 Jun 2012: Titan has a liquid ocean 100 kilometers below its surface. Lars A. Buchhave et al., "An abundance of small exoplanets around stars with a wide range of metallicities" [html], doi:10.1038/nature11121, Nature, online 13 Jun 2012. 24 May 2012: A live interview about nomad or rogue planets in the Milky Way. 28 Mar 2012: ...About 40% of all red dwarf stars have a super-Earth orbiting in the habitable zone where liquid water can exist on the surface of the planet. Three tiny exoplanets suggest Solar System not so special, doi:10.1038/nature.2012.9786, by Ron Cowen, Nature, 11 Jan 2012. 12 Jan 2012: We conclude that stars are orbited by planets as a rule, rather than the exception. B. E. Schmidt et al., "Active formation of 'chaos terrain' over shallow subsurface water on Europa" [html], doi:10.1038/nature10608, Nature, online 16 Nov 2011. 4 Oct 2011: Snow has been falling on Enceladus for up to 100 million years. Earth-like planets pile up by Geoff Brumfiel, Nature.com, 19 Aug 2011. The Times and the Starship by Paul Gilster, Centauri Dreams, 19 Aug 2011. P. Hartogh et al., "Direct detection of the Enceladus water torus with Herschel" [abstract], doi:10.1051/0004-6361/201117377, pL2 v532, Astronomy & Astrophysics, 14 Jul 2011. 23 Jun 2011: Enceladus's plumes come from a salty ocean beneath its surface. Does Life Exist on Distant Moons? by Bruce Dorminey, ScienceNow, 22 Jun 2011. Dwarf planet Haumea shines with crystalline ice, EurekAlert, 12 May 2011. Outcast Planets Could Support Life by Jon Cartwright, ScienceNow, 11 Feb 2011. ...The First Carbon Planet? by Ken Croswell, ScienceNow, 8 Dec 2010. Alien Planet May Have Come From Another Galaxy by Kristen Minogue, ScienceNow, 18 Nov 2010. Richard A. Kerr, "How Wet the Moon? Just Damp Enough to Be Interesting" [summary], doi:10.1126/science.330.6003.434, p434 v330, Science, 22 Oct 2010. 30 Sep 2010: Chances for life on this planet are 100 percent. 18 Jul 2010: Life on other worlds is the subject of Stephen Hawking's imagination in a recent television program. Was Venus once a habitable planet?, European Space Agency, 24 Jun 2010. 7 Jun 2010: Signs of life on Titan? 24 Apr 2010: ...We have to keep an open mind about where life might be found in the universe. 8 Apr 2010: Multicelled animals live and multiply without oxygen in the deep ocean. 25 Mar 2010: The closer we look, the more water and ice we discover beyond Earth. Eric Hand, "Old rocks drown dry Moon theory" [html], doi:10.1038/464150a, p150-151 v 424, Nature, online 9 Mar 2010. Cassini Finds Plethora of Plumes, Hotspots at Enceladus by Jia-Rui C. Cook, NASA JPL, 23 Feb 2010. Saturn's moon Enceladus could contain life in its icy oceans, the Daily Mail (London), 9 Feb 2010. Ken Jopp alerts us to an interesting conference, 15 Jan 2010. 22 Nov 2009: The deep sea is teeming with species that have never known sunlight, according to the Census of Marine Life. Eric Hand, "Lunar impact tosses up water and stranger stuff" [html], doi:10.1038/news.2009.1087, Nature, online 13 Nov 2009. Titan Shaping Up to Look a Lot Like Pre-Life Earth, Universe Today, 6 Aug 2009. J. H. Waite Jr et al., "Liquid water on Enceladus from observations of ammonia and 40Ar in the plume" [abstract], doi:10.1038/nature08153, p 487-490 v 460, Nature, 23 Jul 2009. How [Enceladus] got its stripes, The University of Melbourne, 15 Jul 2009. Katharine Sanderson, "Sodium traces hint at subsurface ocean on Enceladus" [html], doi:10.1038/news.2009.596, Nature, online 24 Jun 2009. John Spencer, "Planetary science: Enceladus with a grain of salt" [html], doi:10.1038/4591067a, p 1067-1068 v 459, Nature, 25 Jun 2009. 15 Jun 2009: A novel bacterium that has been trapped ...under glacial ice ...may hold clues as to what life forms might exist on other planets. What Life Might Look Like on Jupiter's Europa: New Extreme Species Discovered, by Casey Kazan with Luke McKinney, The Daily Galaxy, 12 May 2009. "Looking for worlds like this one" [html], doi:10.1038/458017a, p 17 v 458, Nature, online 3 Mar 2009. 10 Mar 2009: Earth seeded with life from Ceres? The lower atmosphere of Pluto revealed, European Southern Observatory (ESO), 2 Mar 2009. Andrew Lawler, "NASA, ESA Choose King of Planets for Flagship Missions in 2020" [summary], doi:10.1126/science.323.5918.1154, p 1154 v 323, Science, 27 Feb 2009. "Europa next outer-planet mission" [html], doi:10.1038/4571070d, p 1070 v 457, Nature, 26 Feb 2009. 31 Jan 2009: Titan's atmospheric methane requires a source not visible on the surface. Kevin P. Hand, "Is there life on Europa?" [html], doi:10.1038/457384a, p 384-385 v 457, Nature, 22 Jan 2009 — a review of Unmasking Europa: The Search for Life on Jupiter's Ocean Moon by Richard Greenberg, Praxis/Springer, 2008. "...Titan is a slightly more appealing lunar target than Europa for the next outer-planets mission" [html], doi:10.1038/457358a, p 358 v 457, Nature, 22 Jan 2009. 10 Jan 2009: Methane has been detected in the plume of Enceladus and may be biological in origin. Richard A. Kerr, "Europa vs. Titan" [html], doi:10.1126/science.322.5909.1780, p 1780-1781 v 322, Science, 19 Dec 2008. "...A unique, two-stage selection process for the next major mission to the outer planets...."
Robert H. Tyler, "Strong ocean tidal flow and heating on moons of the outer planets" [abstract], doi:10.1038/nature07571, p 770-772 v 456, Nature, 11 Dec 2008. "...Strong support for the idea that there are liquid oceans on several moons of the outer planets...."
Looking for Extraterrestrial Life in All the Right Places, Ohio State University, 15 Dec 2008. Where did Venus's water go?, European Space Agency, 18 Dec 2008. Carbon dioxide discovered on distant planet, by Katharine Sanderson, doi:10.1038/news.2008.1248, Nature.com, 21 Nov 2008. Cracking the Question of Extraterrestrial Life, The University of Idaho, 6 Aug 2008. Jupiter's Europa - Will It Provide the 1st Proof of Extraterrestrial Life?, The Daily Galaxy, 29 Apr 2008. Plan to identify watery Earth-like planets develops, EurekAlert!, 24 Apr 2008. "Tasting a geyser" [html], doi:10.1038/452516b, p 516 v 452, Nature, 3 Apr 2008. "The geyser of ice and water vapor erupting from the south pole of Enceladus,...contains complex organic molecules, NASA scientists have discovered." 21 Mar 2008: Could an ocean on Titan contain life? Eric Hand, "Probe readies for dip into geyser on Enceladus" [text], doi:10.1038/452139a, p 139 v 452, Nature, online 11 Mar 2008. Case builds for water on Saturn moon, SaturnDaily, 6 Feb 2008. 14 Jan 2008: Extrasolar planets are the subject of a recent interview with Dimitar Sasselov. 30 May 2007: Superficially unrelated articles in Nature caught our attention. Sushil K. Atreya, "The Mystery of Methane on Mars and Titan" [link], Scientific American, May 2007. Antarctic Lake Robot Probe Sets Sights on Outer Space, University of Illinois at Chicago, 19 Apr 2007. John Spencer and David Grinspoon, "...Inside Enceladus" [text], 10.1038/445376b, p 376-377 v 445, Nature, 25 Jan 2007. 2 Feb 2007: Radar reveals methane lakes on Titan. Joanne Baker, "The Falcon Has Landed" (Introduction to Special Issue on the Japanese Hayabusa mission) [summary], 10.1126/science.312.5778.1327, p 1327 v 312, Science, 2 Jun 2006. Hitting Europa Hard, Astrobiology Magazine, 1 May 2006. 9 Apr 2006: Microbes produced methane on Earth 3.5 billion years ago. 13 Mar 2006: Wet Enceladus is featured in a special issue of Science. Richard A. Kerr, "How Saturn's Icy Moons Get a (Geologic) Life," p 29 v 311, Science, 6 Jan 2006. G. Israël et al., "Complex organic matter in Titan's atmospheric aerosols from in situ pyrolysis and analysis" [abstract], doi:10.1038/nature04349, p 796-799 v 438, Nature, 8 Dec 2005. Mark Peplow, "Titan: tapping the flood of data," p 538-539 v 438, Nature, 1 Dec 2005. NASA's Cassini images reveal spectacular evidence of an active moon, EurekAlert!, 6 Dec 2005. I think what we're seeing are ice particles in jets of water vapor that emanate from pressurized vents.... That implies surprisingly warm temperatures for a cold body like Enceladus — Dr. Andrew Ingersoll, Caltech. Titan: Passport to the Early Earth? by Leslie Mullen, Astrobiology Magazine, 1 Dec 2005. "If there is life on Saturn's moon Titan, it's not producing all that methane in the atmosphere." 18 Oct 2005: Dione, another icy moon of Saturn, as Cassini approached it on October 11. 12 Oct 2005: Tethys was photographed by Cassini last month from closer than ever before. The Living Worlds Hypothesis about possible life on Titan: Leslie Mullen interviews David Grinspoon, Astrobiology Magazine, 22 Sep 2005. 15 Sep 2005: Deep frozen water probably lies just below the crust of Ceres. Tiny Enceladus May Hold Ingredients of Life, by Lori Stiles, University of Arizona, 2 Sep 2005. The Lure of Jupiter's Moon Europa, by Ron Greeley, Astrobiology Magazine, 1 Sep 2005. Also at RedNova.com with more pictures, 2 Sep 2005. Cassini findings suggest complex story of venting at the south pole of Enceladus, EurekAlert!, 30 Aug 2005. Cassini Finds an Active, Watery World at Saturn's Enceladus, News Release 2005-124, NASA/JPL, 29 Jul 2005. Titan's Icy Volcanoes Erupting Methane?, by Leslie Mullen, Astrobiology Magazine, 8 Jun 2005. ...Pluto Kin Is a Member of Saturn Family, by Carolina Martinez, NASA, JPL, 6 May 2005. 26 Apr 2005: Organics in Titan's high atmosphere were seen by instruments aboard Cassini. 20 Apr 2005: The only thing we know of that creates mixtures like that is biology — David Grinspoon, re: Titan. Watery atmosphere discovered on Saturn's moon Enceladus, by Maggie McKee, NewScientist.com, 17 Mar 2005. 23 Jan 2005: Huygens landed on Titan on 14 January. Agenor Linea, a feature on Europa, Astronomy Picture of the Day, 18 Dec 2004. Crystalline water ice on the Kuiper belt object (50000) Quaoar, by David C. Jewitt and Ann Luu, p 731-733 v 432 Nature, 9 Dec 2004. Saturn's Moon Dione from Cassini: "...Dione is made of mostly water ice," Astronomy Picture of the Day, 1 Dec 2004. RADAR Surprises from Titan, Astrobiology Magazine, 17 Nov 2004. Dark Echoes from Titan, Astrobiology Magazine, 2 Nov 2004. 28 Oct 2004: Cassini flew by Titan. Phoebe: Comet Moon of Saturn, Astronomy Picture of the Day, 30 Jun 2004. Warren E. Leary, "Craft Confirms a Comet Link for Peculiar Moon of Saturn" (Phoebe) [text], The New York Times, 24 June 2004. Molecular rings could shelter Venus bugs, New Scientist, 28 Apr 2004. ESA's 'shipping forecast' - from Titan!, European Space Agency, 2 Apr 2004. ...Io ...What Earth May Have Looked Like, State University of New York, Buffalo, 19 Mar 2004. Is Europa Corrosive?, Astrobiology Magazine, 19 Feb 2004. E. M. Drobyshevski, "Galilean Satellites as Sites for Incipient Life, and the Earth as its Shelter" [abstract | pdf: 19 pages], lanl.arXiv.org, 22 Dec 2003. Smog Warning, Titan, by Emma Bakes, SETI Institute, Astrobiology Magazine, 27 Oct 2003. Donald B. Campbell et al., "Radar Evidence for Liquid Surfaces on Titan" [abstract], p 431-434 v 302 Science, 17 Oct 2003. Radar reveals Titan's methane lakes, by Stuart Clark, NewScientist.com, 2 Oct 2003. High Tide on Europa, by Cynthia Phillips and Diane Richards, Astrobiology Magazine, 23 Sep 2003. 2003, September 15: Galileo will crash into Jupiter [to avoid contaminating Europa]. 2003, September 8: Oceans and pleasant temperatures may have persisted on Venus for two billion years. New Study Of Jupiter's Moon Europa May Explain Mysterious Ice Domes, Places To Search For Evidence Of Life, University of Colorado at Boulder, 2 Sep 2003. 2003, August 26: Earth's water came from comets? Hydrothermal vent systems could have persisted millions of years... by Sandra Hines et al., University of Washington, 24 July 2003. "If hydrothermal venting can occur without volcanism, ...explorers may have more places than previously thought to look for microbial life in the universe." Rock, Scissors, Paper and Water European Space Agency, 13 July 2003. "...A new class of planets that could be awaiting discovery: 'waterworlds'." Searching for the 'real' waterworld European Space Agency, 9 July 2003. "Science fiction writers and movie-makers have imagined a world completely covered by an ocean, but what if one really existed? Would such a world support life, and what would this life be like?" Europa, by Ralph Greenberg, Professor of Mathematics, University of Washington [n.d.]. "...An article surveying the history of the exciting ideas that Jupiter's moon Europa might have an ocean of liquid water under a crust of ice and that life might possibly evolve in such an environment. The Commentary will describe the situation as it seems today." Europa Diary 1: Landing on Alien Terrain — "...Studying the unique terrain at the edge of the Arctic Ocean, they foreshadow future expeditions to search for life on Europa." by David Grinspoon, Astrobiology Magazine, 12 May 2003. Caitlin A. Griffith et al., "Evidence for the Exposure of Water Ice on Titan's Surface" [abstract], p 628-630 v 300 Science, 25 Apr 2003. 2003, April 2: Is Titan's methane biological? ESA to investigate. Mighty Aphrodite — speculations about life on Venus by David Grinspoon, Astrobiology Magazine, 26 Mar 2003. Life Zone on Venus Possible, by Leonard David, Space.com, 11 Feb 2003. Geology of Europa: Evidence for Water?, by Cynthia Phillips, SETI Institute via Space.com, 23 Jan 2003. Peter T. Doran et al., "Formation and character of an ancient 19-m ice cover and underlying trapped brine in an 'ice-sealed' east Antarctic lake" [abstract], p 26-31 v 100 n 1 Proc. Natl. Acad. Sci. USA, 7 Jan 2003. 2003, January 2: Microorganisms in Europa's ice? Europa: Chewy or Crunchy?, by Lee Siegel, Astrobiology Magazine, 23 Dec 2002. Methane Clouds Discovered at the South Pole of Titan, W.M. Keck Observatory, 18 Dec 2002. Titan: Exploring the origins of life, by Michelle Thaller, Christian Science Monitor, 12 Dec 2002. Featherweight Jupiter Moon is Likely a Jumble of Pieces, jpl.nasa.gov, 9 Dec 2002. Bands on Europa — detailed maps of five distinct bands, by Linda M.V. Martel, Hawai'i Institute of Geophysics and Planetology, 25 Nov 2002. 2002, October 30: Europa acts like a planetary lava lamp. 2002, October 27: Ice on Europa — thick or thin? 2002, October 3: The chance for life in ice-covered oceans on distant moons is reconsidered. 2002, September 25: Bacteria in atmosphere of Venus? ESA to search for life, but not as we know it — more about Cassini mission to Titan, ESA, 19 Sep 2002. No rest on the way to the most mysterious of Saturn's moons re: Cassini mission to Titan, ESA, 28 Aug 2002. All The Right Stuff To Be Life re: Elisabetta Pierazzo and Christopher Chyba, SpaceDaily.com, 23 May 2002. 2002, Feb 7: Life on Europa would benefit from tides. Scientists Apply Earth's Hydrothermal Plume Dynamics To Europa, SpaceDaily.com, 21 Jan 2002. Ice Explorer Conceived for Other Worlds Gets Arctic Test, NASA JPL Newsrelease, 10 Jan 2002. 2001, December 7: Do bacteria give Europa its color? Europa's Ice Crust Is Deeper Than 3 Kilometers, UA Scientists Find, by Lori Stiles, The University of Arizona, 8 Nov 2001. Several large impact craters have central peaks [images], which they would not if it were less. Thanks, Ron Baalke. Listening for an Ocean [on Europa], Office of Naval Research, September 2001. Callisto's watery secret, by Erica Klarreich, Nature Science Update, 26 July 2001. Europa: Chewy or Crunchy?, by Lee Siegel, NASA's Astrobiology Institute, 22 June 2001. 2001, June 15: Nutrients available to support life on Europa. MIT researchers seek ocean on Jupiter's moon through its sounds, MIT News, 4 June 2001. Thomas B. McCord et al., "Hydrated Salt Minerals on Ganymede's Surface: Evidence of an Ocean Below" [abstract], p 1523-1525 v 292 Science, 25 May 2001. Ices, rock, organic material - what is Titan really made of? European Space Agency, 15 May 2001. Redefining "Life as We Know it", by David Pacchioli, SpaceRef.com, 4 May 2001. Worms living on methane ice half a mile deep in the Gulf of Mexico. An Ocean in Space, by David Pacchioli, SpaceRef.com, 15 April 2001. Focus on Europa, by Henry Bortman, NASA's Astrobiology Institute, publicized 13 April 2001. Out in the Cold: Ambitious plans to penetrate icebound Lake Vostok have slowed to a crawl, by W. Wayt Gibbs, Scientific American, March 2001. Ganymede's Liquid Past, NASA's Astrobiology Institute, 9 March 2001. Scientists find evidence for wet, slushy Ganymede, Jupiter's largest moon, by Tony Fitzpatrick, EurekAlert, 28 February 2001. 2000, December 17: Ganymede appears to have an ocean miles below its surface. Europa's lifelines, by Jeff Hecht, New Scientist, 04 November 2000. 2000, August 25: Ocean on Europa looks even more likely. New revelations, riddles about solar system's most intriguing satellites, by Richard Stenger, CNN.com, 23 August 2000. Scientists Discover Tidal Squeezing On Europa, by Maia Weinstock, Space.com (cookies! ), 10 August 2000. Oily ocean found on distant moon (Titan), by David Whitehouse, BBC News Online, 30 July 1999. New Outer Satellite of Jupiter Discovered, from the Minor Planet Center at the Smithsonian Astrophysical Observatory and the Spacewatch Project of the Lunar and Planetary Laboratory of the University of Arizona, 20 July 2000. 2000, July 3: Future missions to Europa should be sterilized. 2000, January 27: A radiation-driven ecosystem on Europa? 2000, January 11: More evidence for Europa's ocean. 1999, December 16: AGU says Europa looks good for life. Europa Web Sites from Icepick, the Europa Ocean Explorer. 1999, November 5: What Does It Take for a Moon to Support Life? Scientists pin hopes on prospects for life on Europa, CNN.com, 14 October 1999. 1999, September 30: Sulfuric acid on Europa's surface. Hidden Antarctic lake links to alien life, BBCNews, 27 September 1999. Life in the Solar System, by Julian Hiscox in Science Spectra, 1999. Galileo buzzes Europa, by Tony Philips in Space Science News from NASA's Marshall Space Flight Center, 2 February 1999. Europa Orbiter to look for signs of life, by David Watanabe, exosci.com, 31 January 1999. The frosty plains of Europa: "As Galileo returns new images of Europa, NASA scientists prepare to study samples from a potentially similar environment here on Earth" by Dr. Tony Phillips and JPL press releases. Space Scienc News from NASA's Marshall Space Flight Center, Dec. 3, 1998. Scars on an icy moon by David Whitehouse, BBC News Online, December 3, 1998. The search for life gets a new boost By Paul Recer, Associated Press via MSNBC.com, 14 October 1998. 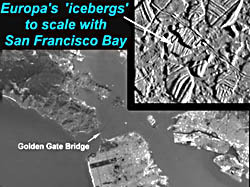 Galileo takes a close look at icy Europa in Space Science News from NASA, 2 October 1998. MSNBC - Salty traces hint at Europa's ocean Reuters, May 21, 1998. 1998, April 7: Water vapour on Titan discovered by the Infrared Space Observatory. Clues to possible life on Europa may lie buried in Antarctic ice by Dave Dooling, Space Science News from NASA's Marshall Space Flight Center, 5 March, 1998. 1998, March 2: New images of Jupiter's moon Europa were unveiled. 1997, December 16: NASA's Galileo spacecraft today made its closest-ever flyby of Europa.